The only UK masters degree in the field of cyber risk to combine aspects of business and information technology, MSc Cyber Security Risk Management will equip you with a blend of skills that are in demand in the sector. Unlike other UK cyber security masters degrees, which have a computer science focus, this unique programme combines modules from a range of disciplines. It is therefore ideally placed to meet the demand for professionals with the necessary management skills, as well as the technical knowledge, to effectively manage cyber security risks. You’ll be taught by experts in risk management, cyber security and computer science. In addition, you’ll benefit from the co-location of several specialist research centres at Southampton. These include the University’s Academic Centre of Excellence for Cyber Security Research, which was set up to advance the UK government’s cyber security agenda, and the highly regarded Centre for Risk Research. You’ll graduate with an accredited degree, enabling you to apply for credits towards professional risk or insurance qualifications. Cyber security is a global concern for companies and governments, but there is a recognised shortage of cyber security practitioners with the breadth of skills required to understand and manage the risk of cyber attacks. MSc Cyber Security Risk Management, the only UK cyber security programme to be offered within a business school rather than a computer science department, is designed to fill this gap. Rather than focusing purely on the technical aspects of cyber security, MSc Cyber Security Risk Management offers a unique combination of modules encompassing business risk management, computer science and cyber security. You’ll gain a grounding in the essential technical aspects of the subject, but you’ll also develop the managerial and analytical skills needed to identify risks, communicate them within an organisation and put effective cyber risk management approaches into practice. Southampton’s expertise in cyber risk research has been recognised with the award of an Academic Centre of Excellence for Cyber Security Research, funded by GCHQ and the Economic and Social Research Council as part of the UK government’s national cyber security strategy. Our academics are active partners in the Centre’s work and bring their research insights to the course. 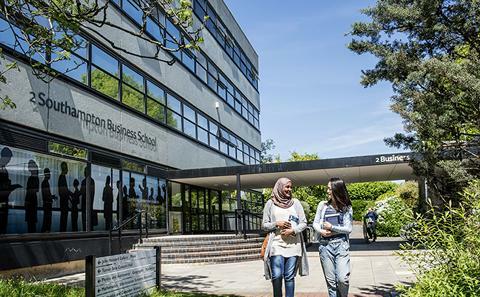 You’ll also benefit from expertise within the Business School’s Centre for Risk Research, the only specialist centre of its type in a Russell Group university. We welcome applicants from a range of academic backgrounds. Many of our students bring some professional experience to their studies, while some join us straight from their undergraduate studies. This is a full-time, one-year course. For the first nine months you’ll study compulsory and optional modules, drawn from the Business School, Social Sciences and Electronics and Computer Science. You’ll spend the final three months of the course on your dissertation. In the first semester, you’ll cover the principles of risk management, explore corporate risk and security management, and gain a foundation in real-world cyber risk issues. In the second semester you’ll explore cyber crime in more depth, looking at topics such as hacking, ‘dark markets’ and policing the Web. You’ll also gain a greater understanding of the behavioural aspects of risk taking and decision making, and study research methods in preparation for your dissertation. You can tailor the course further by choosing a dissertation topic in an area that will further your interests and career aspirations. Because of our close links with the Academic Centre for Excellence in Cyber Security Research, it may be possible to contribute to a real-world GCHQ cyber security project through your dissertation. Our academics are active researchers, many of whom are working on current cyber security and risk issues with industry and government partners, such as EY and GCHQ. They incorporate the latest thinking into their teaching and use real examples to illustrate theories and concepts. 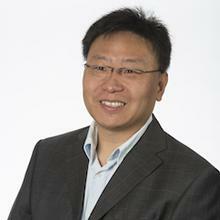 Programme leader Dr Tiejun Ma, who designed the programme, works closely with colleagues in Electronics and Computer Science on a range of projects including research into aspects of cyber resilience and cyber risk analysis. Professor Johnnie Johnson, a world-renowned expert in the field of decision making in uncertain environments, teaches the popular Risk Taking and Decision Making module. The optional Project Risk Management module is taught by Professor Chris Chapman. He is a highly influential researcher in the field of risk, and co-author of the leading text How to Manage Project Opportunity and Risk. As well as benefiting from the expertise of our academics, on some modules you’ll be taught by external risk practitioners, including an experienced risk management consultant and the chief risk officer of a major insurance firm. Our industry connections help to ensure you are up to date with the latest sector issues. We attract guest speakers from global companies such as J.P. Morgan, Zurich Insurance and Goldman Sachs, as well as from the main risk and insurance professional bodies. In addition, through the IBM Academic Initiative, we regularly host guest lectures by IBM senior managers and facilitate IBM graduate opportunities for our students. Our academics are actively involved in the work of the internationally renowned Centre for Risk Research, which has a wide range of collaborations with partners in the finance industry. It has been awarded a number of major funding grants to explore risk taking and decision making in fast-changing financial markets, such as a project with London Capital Group Holdings plc on real-time modelling of financial decisions. Collaborations like this one can provide excellent opportunities for postgraduate projects. The only UK cyber security masters degree with a multidisciplinary approach rather than a purely technical focus. Gain a foundation in technical skills and develop your management capabilities through a unique combination of business, computer science and criminology modules. Taught by leading academics in risk management and cyber security, and informed by the activities of Southampton’s prestigious Academic Centre for Excellence in Cyber Security. Additional learning opportunities include industry seminars and the possibility of participation in real-world research projects, internships or placements. Accredited by the Institute of Risk Management and the Chartered Insurance Institute, enabling you to apply for credits towards professional qualifications. Graduates have gone on to work for PwC, Accenture, Marsh and Goldman Sachs. Dr Tiejun Ma is Associate Professor in Risk and Decision Analytics within Department of Decision Analytics and Risk, Southampton Business School at the University of Southampton. If you do not quite meet our English language requirements for direct entry, you may be eligible to apply for one of our pre-sessional English language courses. Please visit the Centre for Language Studies website for further information. Students must choose ONE Option module totalling 15 CATS/7.5 ECTS in Semester 1. Every year, professional risk managers and industry leaders from companies visit us to discuss careers in the sector, helping you to plan your next steps. Past speakers have come from IBM, Goldman Sachs, PwC, Old Mutual, and the Chartered Insurance Institute. The MSc in Cyber Security and Risk Management is accredited by the Chartered Insurance Institute and the Institute of Risk Management, which means you’ll be able to apply for credits towards professional qualifications. You’ll learn through a mix of lectures, seminars, private study and independent research. Some modules include lectures from industry speakers. Activities such as the analysis of key risk publications, group presentations and simulations will help you to apply you learning. They will also enhance your team working, communication and critical thinking skills. In addition, academics use examples from their own research to demonstrate the practical application of theories and concepts. Some of the quantitative and technical modules involve computer lab sessions, in which students can analyse data or try hacking into and defending systems in a lab environment. You’ll have access to Bloomberg terminals and a wide range of databases for quantitative analysis, as well as computer facilities in the Business School and within Electronics and Computer Science. Assessment methods will depend on your module choice, but will include exams, coursework and your dissertation. This course has a relatively small intake so the programme leader is able to get to know all the students and keep track of their progress. Your personal academic tutor can provide advice on course-related matters, and the University offers a range of learning and support services should you need them.